Conor Lovett and Judy Hegarty Lovett, leading Beckett interpreters, and John Minihan, the photographer who captured Beckett on film, talk to Rosemary Rogers. 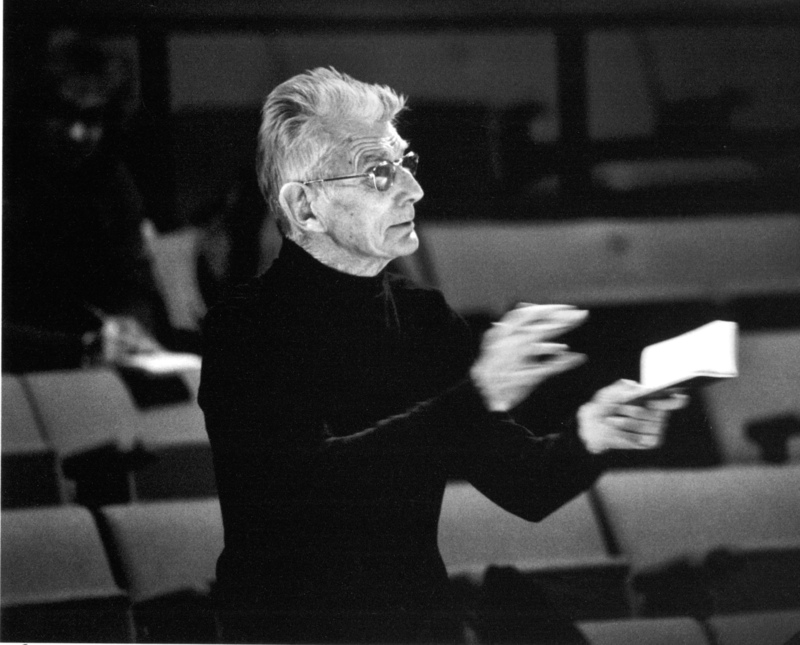 Samuel Beckett created the greatest body of literary work – novels, short stories, poetry, essays, and, most famously, plays for theatre, radio, and TV – in the 20th century. But the Irishman and his artistic output is often judged, unfairly, as too esoteric, too inaccessible. Perhaps it’s best not to analyze his work, instead just to give in to it, listen to the musicality of his language and, for a while, live in his absurd, tragic, and very funny universe. Inmates in prisons around the world – with little or no education – instinctively “get” Beckett. They’ve been staging and performing Waiting for Godot, the most emblematic story of waiting ever, for over 50 years. 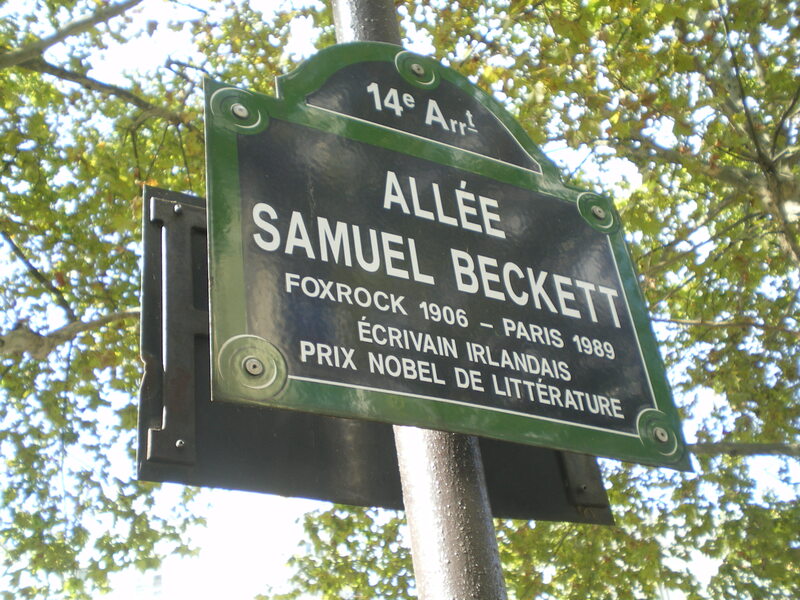 While Beckett deplored his great success – he called his Nobel Prize a “catastrophe” and later gave away the earnings from his works – the earlier Beckett had despaired, convinced no one would ever want to read what he wrote, let alone pay for it. 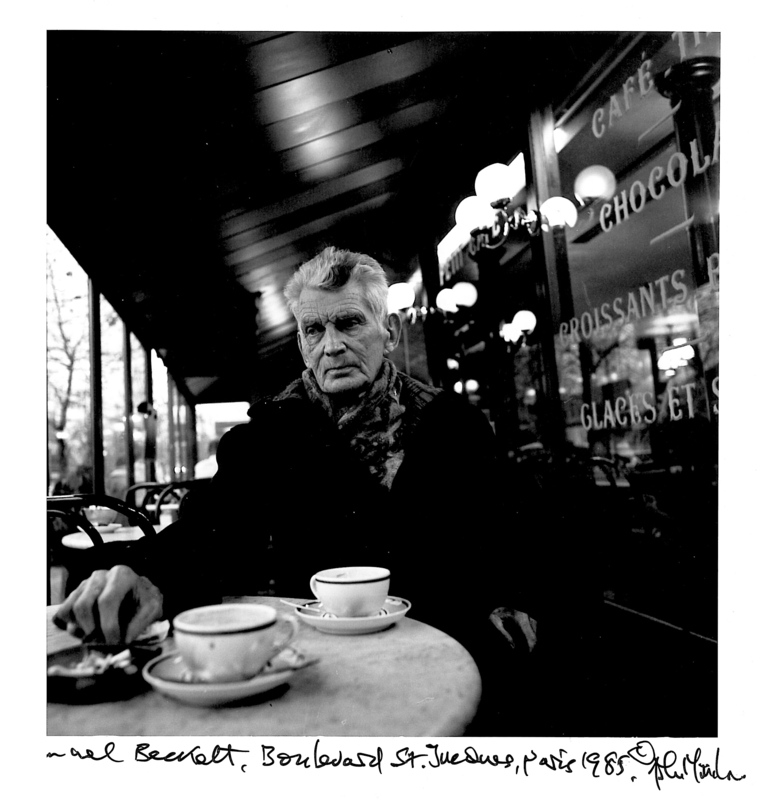 But after World War II and his brave service in the French Resistance, Beckett returned to Paris, a changed man. From 1947-1950, years he called “the siege in the room,” he began a period of his greatest productivity – he was, at last, freed of his demons. And, he now began to write in French. During “the siege” Beckett wrote three novels, Molloy, Malone Meurt, and L’Innommable. Today he is best known for his plays, but Beckett felt his prose fiction was his central work. The novels are complex, each one told by a disembodied voice, possibly three of literature’s most unreliable narrators. Beckett foregoes exposition, plot, and character descriptions; he doesn’t really expect the reader to understand what’s going on, but rather to just enter the psyche, “the relentless interior monologue we call the mind” of his odd characters. The narrators are stand-ins for humanity, confused souls who still manage to find humor in their despair. 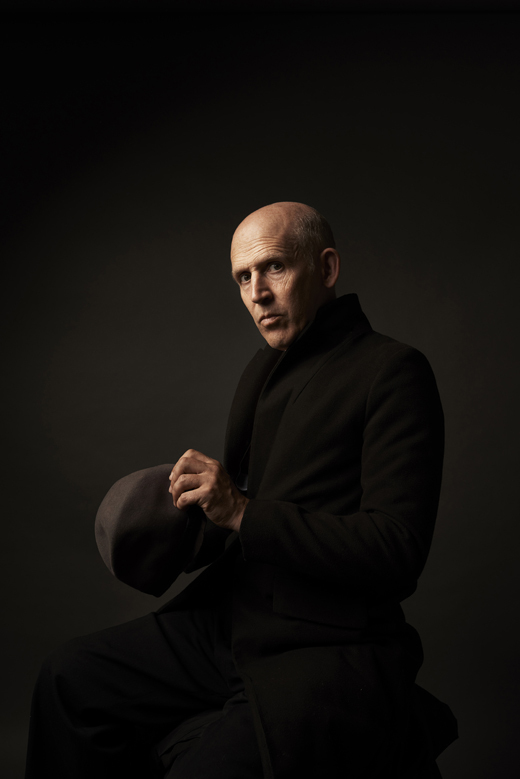 Leading Beckett interpreters, Conor Lovett and Judy Hegarty Lovett (he acts, she directs), recently dramatized the novels at Lincoln Center’s White Lights Festival. 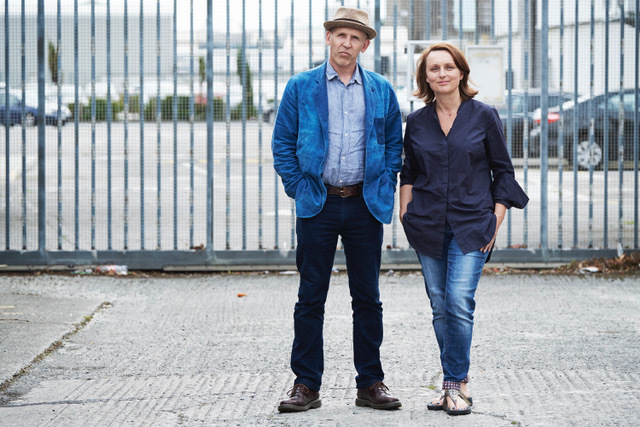 The couple, founders of Gare St. Lazare Players Ireland, brought The Beckett Trilogy to the stage in an unforgettable night of theater. Judy condensed, seamlessly, the novels into three excerpts and Conor’s one-man performance transforms Beckett’s voices into corporeal form as he acts each long text without a fumble. The audience soon forgets these scenes weren’t originally written for the stage and, for readers who have struggled with the trilogy, the novels magically come to life. How was it possible to condense three novels into three dramatic scenes? Judy: There was a great sense of the possible. We just jumped in and did it. The work is not driven by plot and narrative, so it felt easy enough to unravel the relentless interior monologue we call the mind. The texts are so long, so complex, memorizing must have been a hard go. Conor: The memorizing is slow work but it also gives me the opportunity to let the text get into me somehow. Any actor knows that you can only really make the text sing if you really know it. Your one-man show brought to mind an ancient Irish storyteller, a seanchaí, but that’s an odd word to use for prose written in French. Conor: Fintan O’Toole in the Irish Times referred to “the seanchaí unplugged” in reviewing our work. It’s a lovely idea because the seanchaí is already the very simple form of storytelling where a man or woman regales their audience with nothing but words. For me, the “unplugged” seanchaí is closer to Beckett’s world because there is no performance inferred, it’s just the consciousness often in freefall. How were you able to put disembodied voices on stage? Judy: We have always aimed for a non-representational delivery. We are looking for the audience to join the person before you who at times narrates the character, at times becomes the character and at times looks to be improvising the text. It hovers, it does not land. It’s been said that Beckett considers the novels his best work. Thoughts? Judy: The depth of emotion, philosophy, and pure human feeling in the work seems to suggest that he was an incredibly committed artist. 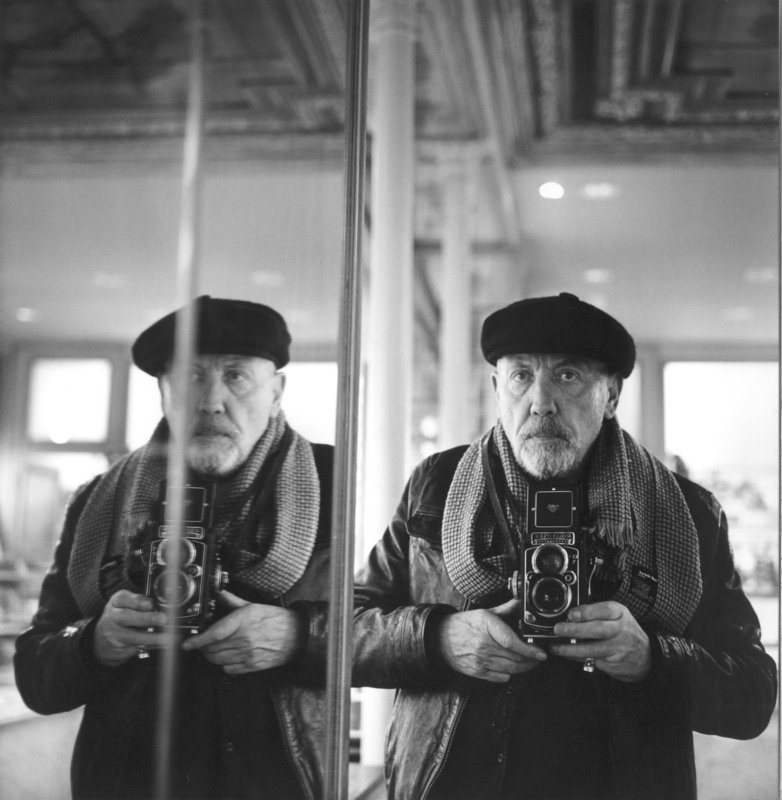 I don’t see him so much as a novelist or a playwright or a poet, but as an artist who happened to use writing and words but also made pictures and performances. Conor & Judy: We’re excited to bring our work to the Abbey Theatre in Dublin from April 11 to 14 this year and on tour in Ireland. It’s happening on Beckett’s birthday too, so it’s a great reason to be to Dublin. The first time Minihan heard Beckett’s name was in 1969 while he was working at London’s Evening Standard. A frantic editor was yelling to the picture desk – it seemed an obscure Irish writer by the name of Samuel Beckett had just won the Nobel Prize – and they had no photos of him. Minihan, a Kildare man, inwardly rejoiced. “It wasn’t the most fashionable time to be Irish in London, the IRA and all that. Then, out of nowhere, an Irishman wins the Nobel.” Minihan vowed to find him – “As an Irish photographer, it was imperative for me to photograph this Irish writer” – and, in the years to come, would shoot some of the most iconic photographs ever taken of Beckett. It helped, of course, that Beckett had one of the greatest faces ever photographed, especially in black and white. announced, “You can take a picture now if you like.” As natural light leaves, artificial lights come on and Beckett seems to fall into a reverie, staring into space.